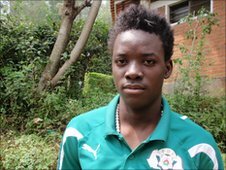 Junior tournaments like the African Under-17 championship are often used to unearth new footballing talent - but one of the big stars of the current event in Rwanda had already been spotted. Burkina Faso midfielder Bertrand Traore is only 15 years old but he could be about to join English Premier League champions Chelsea. The youngster attracted their attention at the Under-17 World Cup in Nigeria in 2009 - where, at 14, he was the tournament's youngest player - and they have followed him ever since. That interest has sparked some very big ambition in the teenager. "I want to play in the first team for Chelsea, I want to play the European Champions League with the big names," the teenager told the BBC's African sports programme Fast Track. "I want to play every match for Chelsea and in the future I want to become the best player in Africa and maybe Europe also." 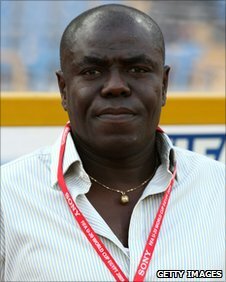 His talent has been on display for all to see during the U17 competition in Rwana, with Sellas Tetteh, coach of the Rwandan national team and the man who led Ghana to U20 World Cup triumph two years ago, heaping praise on the young Burkinabe. "He's a great player - a wonderful player, delightful to watch, intelligent on the ball, a good passer of the ball, fearless, daring - he's the kind of player you love to see all the time. He has brought life to this tournament," Tetteh told BBC Fast Track. Manchester United and Marseille are amongst the clubs who are apparently as impressed as Chelsea and Tetteh, but Bertrand Traore says he wants to make his mark at Stamford Bridge. "I like Chelsea because we have Africans there - Drogba, Essien, Obi," he said. There are restrictions on European football clubs signing young players, so Traore knows he might have to wait. "I have to continue to play well in every game, I have to work hard if I want to become a big professional player." He will be helped in that preparation by his brother Alain, who is a professional in France with Auxerre. "I learn many things from him - he shoots well from free-kicks, so when it comes to holidays in Burkina he teaches me free-kicks; he gives me advice." There is still a very long way to go for the young man with big ambitions but if things go well for him, Bertrand Traore could be a very well-known name in the not too distant future.